The latest big thing in bicycles is Electric (battery assisted) bikes. Coastal Cruisers has a selection of these very cool bikes for sale and for rent. Electric bikes are easy to ride and made for comfort. The controls are simple and the motors are smooth and quiet. You can pedal just like a normal bicycle and when you want to take a break or get tired you just twist the throttle and the motor takes over! Are they street legal? They aren’t allowed on sidewalks – which prohibit motorized vehicles – and because of the motor should be registered right? How is this working? 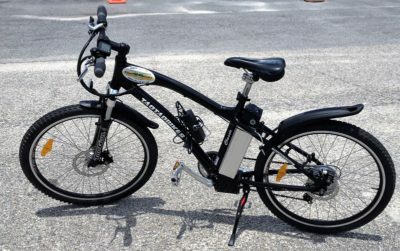 Electric Bikes are basically a new version of a Moped. They are commonly used on sidewalks in our area and are not allowed on the street in traffic as they are NOT registered.